There are lots of options for finishing the edges of your quilts. What's a tried-and-true method? What's a quick method? What do I do if my corners are rounded? How do I miter the corners? Come and get these and your other burning binding questions answered this Saturday! 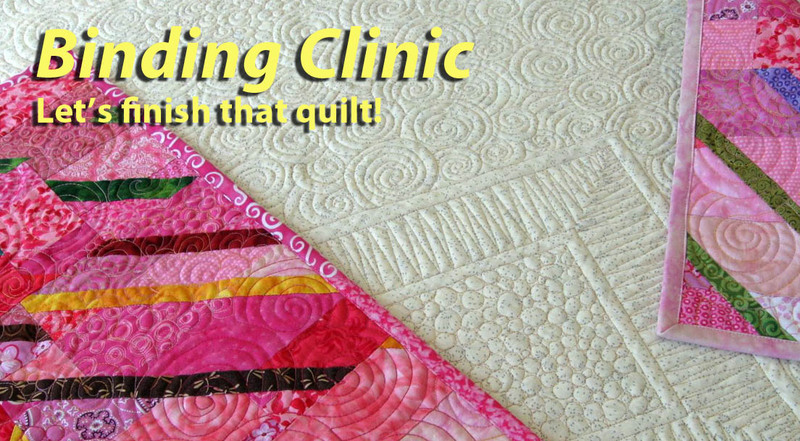 I'll be teaching a Binding Clinic this Saturday, August 2, at Pins and Needles Quilt Shop. We'll cover the popular double fold binding method and a few other variations on this theme, as well as how to miter the corners and make that ubiquitous invisible join. Call today to sign up for class! Learn several cool binding techniques and take advantage of the Pins and Needles anniversary celebration. It will be a great day—special sales throughout the store, food, fun and laughter… and they are giving away a Quilters Retreat (with a special incentive if you take the Binding Class). It will be a binding experience! "Join" me.